England this summer kicked off with a hosepipe ban due to drought. A ban that was immediately followed by six steady weeks of rain. While parts of the world suffered dry, hot conditions, we were quickly becoming a swamp. A chilly one at that. 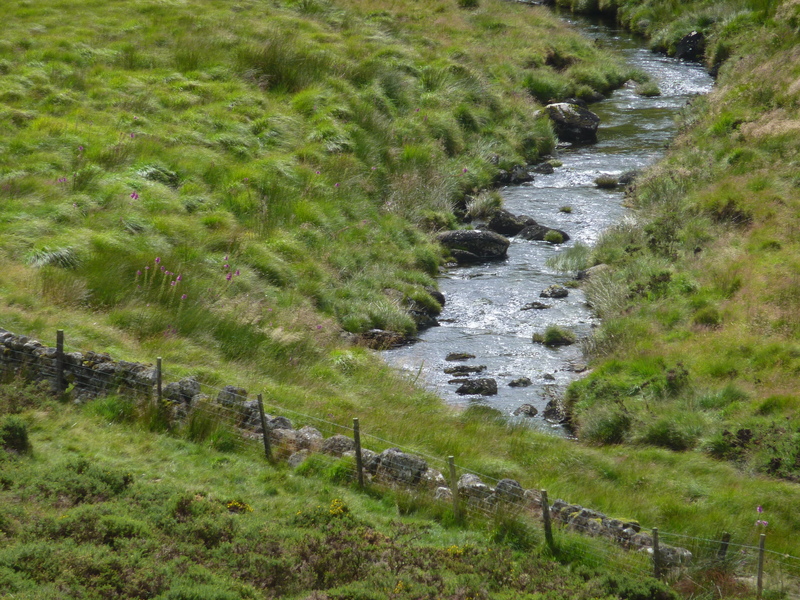 Dartmoor has a temperate climate that is usually wetter and milder when compared to other locations of the same elevation in England. The rainfall tends to be associated with Atlantic depressions. As we’ve barely had two days in a row without rain this summer, the Atlantic may be due for some Prozac. 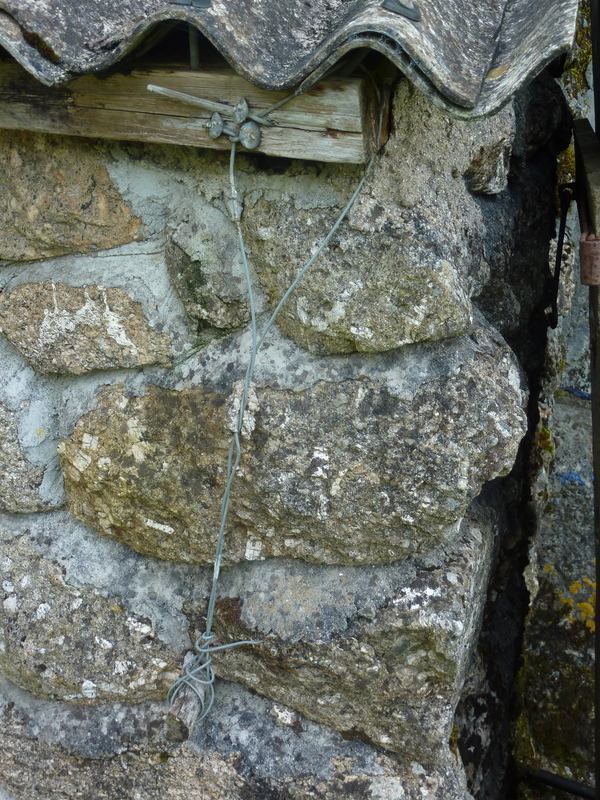 It’s not just the outside that is damp, but our old stone farmhouse is suffering in a few places, too. It is important to note that damp in an old stone house is common. We know we need to replace the roof, and have lined up our team. In about three weeks, we carefully remove the slate tiles (as we will put them back on the roof with reclaimed tiles to replace broken/missing ones) and take the roof down to the rafters. Here, we will install breathable lining and insulation; put in place proper lead flashing, new fascia boards and guttering; and, return the slate tiles. 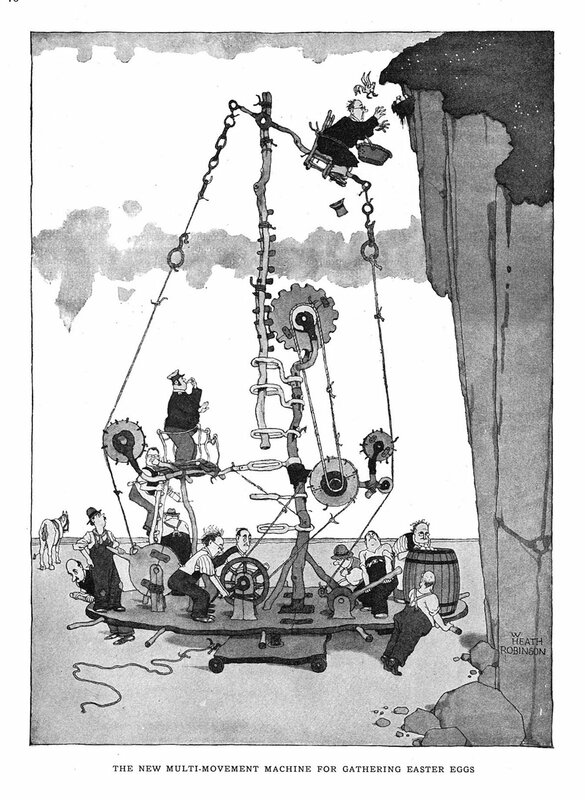 Roger frequently says of the current guttering, “It’s very Heath Robinson.” And we have a few examples of temporary fixes that used whatever was to hand. My biggest concern is that our hot water tank is made of copper rather than stainless and due to a silly bit of engineering, the electric fuse box currently sits underneath this tank. 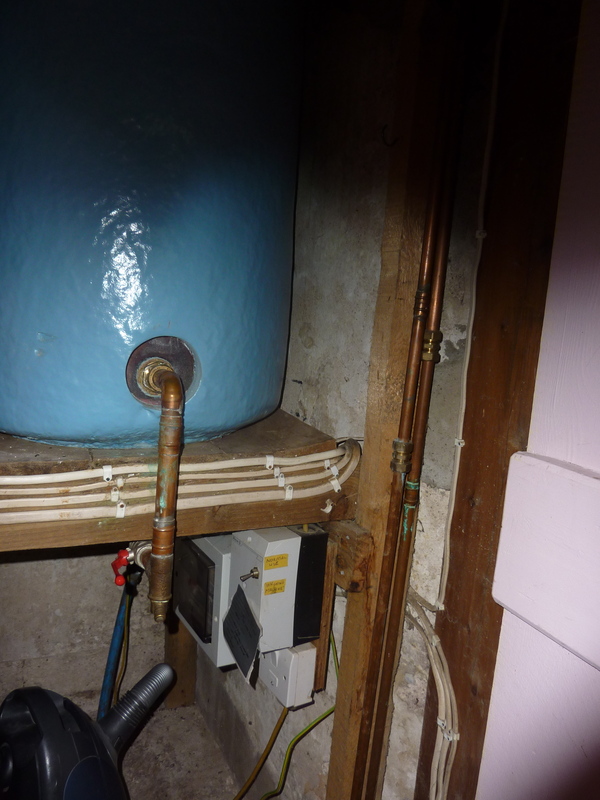 With acidic water, a copper tank may last only 8-10 years. We have an electrician coming out to move that fuse box. This wire is helping to keep the shed roof in place. An old house necessarily has an evolution to it. 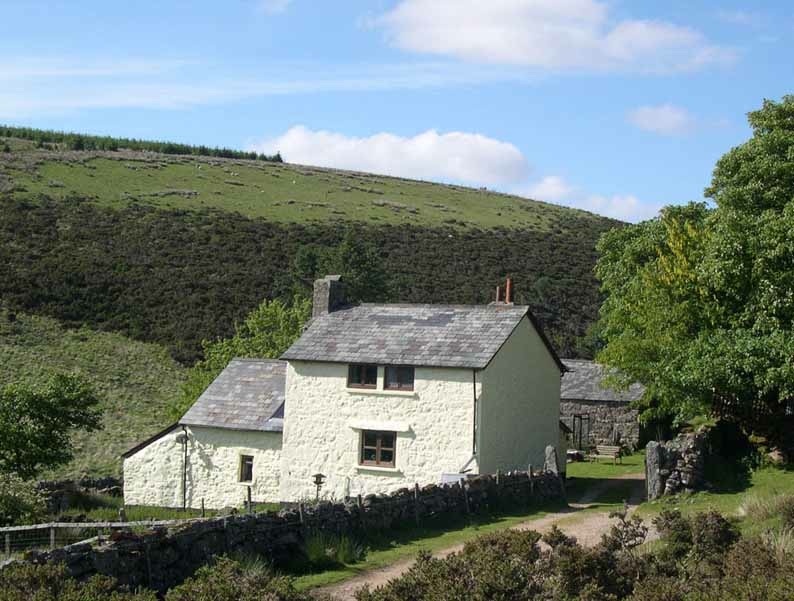 Centuries ago, people living on the moors would have had open windows; thatched roofs with large overhang, livestock living in the house for warmth, and the buildings would have been able to breath and the damp less contained. Any moisture coming through the stones would leave through the stones, taking the easiest path. In other words, not all that damp inside. Over time, some of these paths have been altered as the way we live has changed. Some of the efforts to keep water out have instead encouraged it to stay in the stones: concrete rather than lime mortar, non-breathable weather shield exterior paint, and the modern desire to live in a warm and draft free home. The problem isn’t pervasive, but a few spots cause concern. To address this, we’ve wire brushed the interior stones to rid them of any moss and moved furniture away from the walls so the stones can breath. 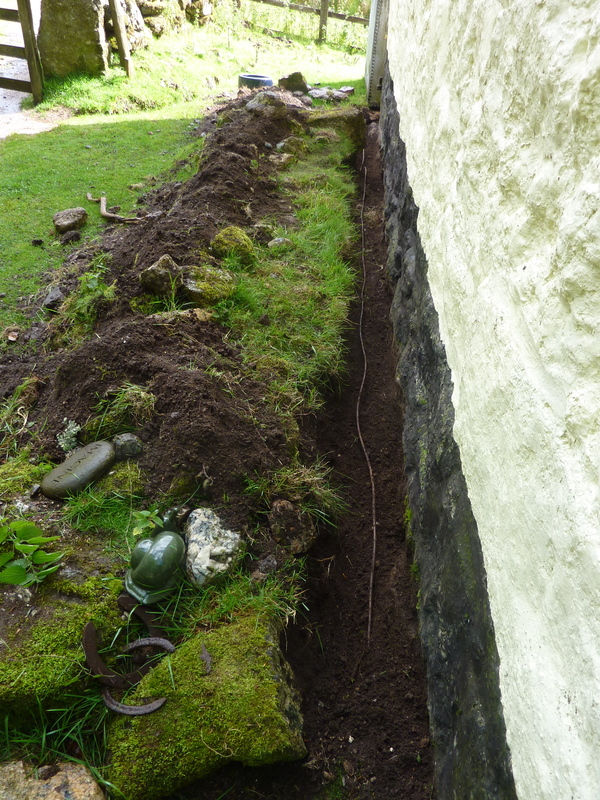 On the outside, we’ve cleared neglected trenches around the house to improve the drainage away from the house. 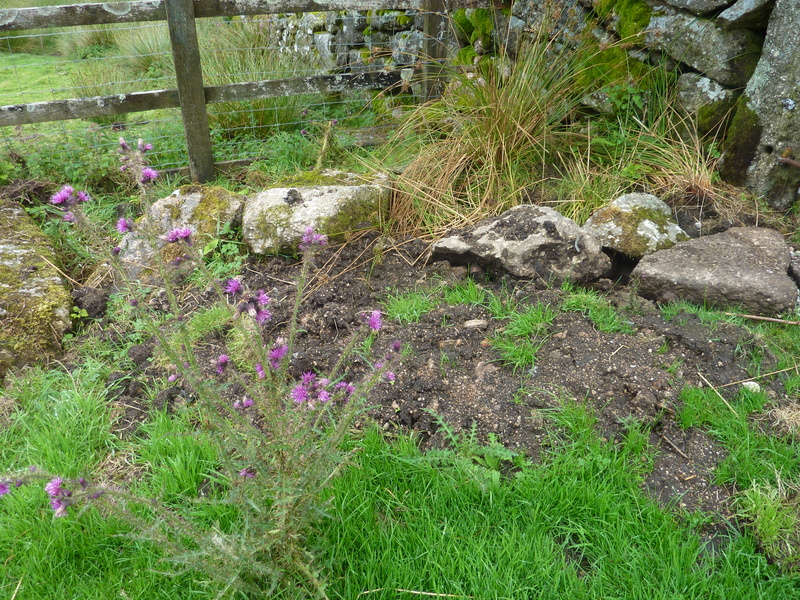 Once dug and cleared of grass and nettles, the trenches are back-filled with several tons of pebbles. This technique is known as making French Drains, we affectionately think of it as making Achy Back. We’ve met with a stonemason who has confirmed our efforts and is providing us a tutorial on replacing the concrete mortar with a lime mortar. And, we’ve scheduled the roofers. Some of the newly cleared trenches. The water we do want in the house comes from a natural spring. 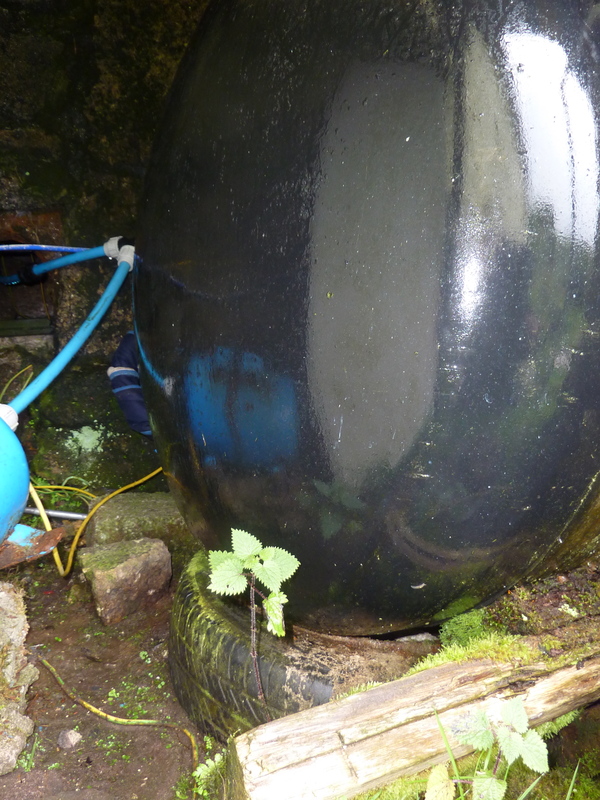 Our spring is about 100 metres from the house and is gravity fed to a tank in a leaky shed outside. From here, the water is pumped back into the house. People have been drinking this water for centuries and it tastes wonderful. We know ours is slightly acidic, which poses a challenge for the copper pipes and tank that transport the water throughout the house, but we recently had it tested for other bacteria. When I took the water samples to a testing centre in Exeter, an eccentric mad scientist at the door of a dilapidated house met me. It took a long time to locate this place as the directions were out of date, “It’s across the road from the bus stop and there are cream pillars with red numbers painted on them.” Truth: Overgrown hedges covered any pillars and red paint had long since worn away. Finding this place in a timely way was critical, as the water samples must be dropped off within a few hours from collection. I imagined a similar sense of urgency experienced by men dropping off sperm samples. Our water test results show that we have safe water in regards to bacteria and other unwanted bits; we just need to address the acidity. In order to do this, we will install a UV filter and PH adjuster to the tank but not before we have the roof and flashing repaired on the shed. Roger and I also must empty the storage tank, lay a stable floor (the tank currently rests on old tires), and insulate the space so that in winter, the water doesn’t freeze. Water tank resting on tire. It is a curious thing to have no water in a place that is known for its wet conditions and yet one day our tank was dry and not so much a drip off of the taps. A quick inspection of our spring indicated that it was running well. We needed to remedy the situation and so called in the experts…they came the next day. Our waterman used a pump to reverse the water flow and push whatever was in the pipe back to the source. 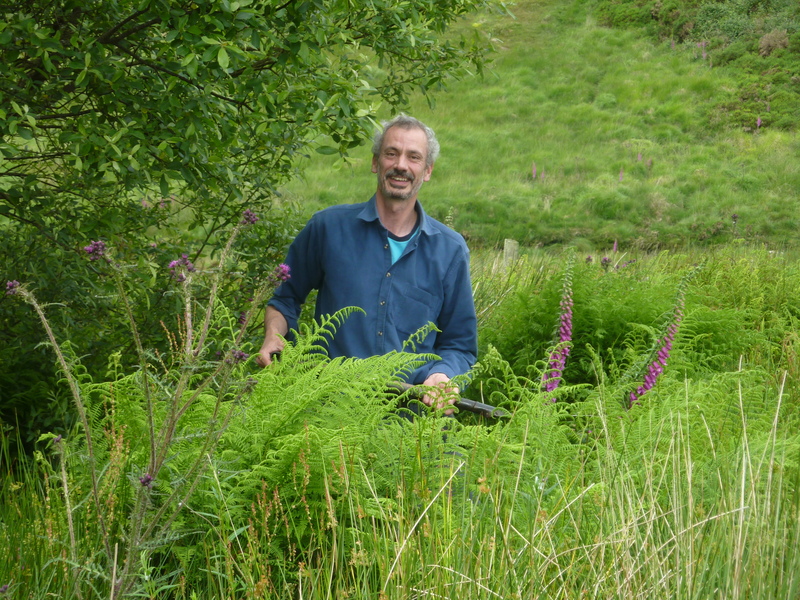 Roger dug out reeds and other plant life that were growing around the stream, repaired the cover and cleared the filter. After a bit, the water was bubbling again. It appears that we had silt or an air block that caused the flow from the stream to just stop. Once resolved, we had to keep the water running for about an hour to flush out any sediment in the pipes. When the water was running clearly, we turn off the taps only to discover that the entire downstairs was flooded! 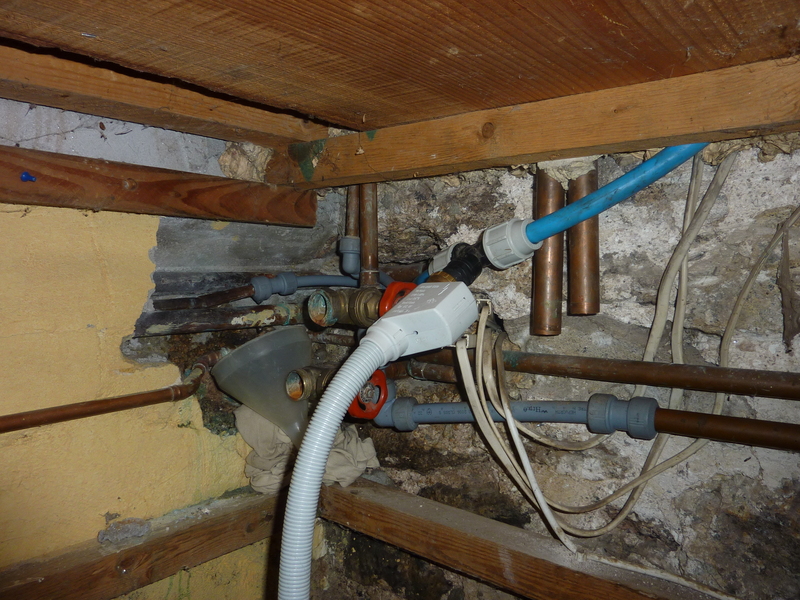 One of the pipes had stopped draining into the soak-away and instead was filling the house. From no water to flooding in less than 3 hours! The next day, Roger and I started to clear the offending soak away. We removed reeds, lifted boulders, and dug a trench. Once we saw that the water was flowing freely, we filled the trench with gravel and sand, placed the boulders strategically to prevent the pipes getting damaged and returned the reeds for water flow through the roots. Having never built a soak away before, we were learning as we went. So far so good. We had a rare break from the rain, and this day of labor was hot and sunny. After we completed our soak away restoration, we took our tired, muddy, and sweaty selves down to the river and climbed in for a swim. It was fantastic to sit in the river surrounded by the wilderness and the relaxing sounds of the birds, water and breeze. The West Dart River and our wading pool. Returning inside and filled with a sense that all was well with the world; I noticed a bit of water on the kitchen floor. Why this puddle? Turns out, it was a small stream inside as one of the copper pipes was leaking. We phoned Martin.